Do You Want to Lose Weight Without Drugs? "How Protein Can Help You Get Leaner And Lose Weight?" There are 3 major categories that all foods can be divided into. These are also known as macronutrients. Macronutrients are your proteins, carbohydrates and fats. We eat a combination of all three on a daily basis, but did you know that only 2 are needed for you to survive and they also happen to be the most effective in helping you lose weight? And one in particular is absolutely necessary if you want to burn off your stubborn fat and transform your body. Unfortunately, most of us have been gravely misinformed about how each macronutrient affects our body, which is why weight gain has become such a perpetual problem. Each macronutrient provides something to your body. Protein provides structure for your cells, carbohydrate provides immediate energy for activities and fat provides long term energy for physical activities as well as energy to run all of your metabolic processes. But protein and fats are the only two macronutrients essential for your body’s survival. This is why when you’re trying to lose weight and cutting calories it’s vital that you take in sufficient amounts of protein and fat. In particular, it’s vital that you consume enough protein on a daily basis in order for you to sustain (or build) a lean body while trying to lose weight. A minimum daily protein intake is between 0.35 - 0.5 grams per lean body weight, and that’s just enough to keep your present “structural” integrity…if you will. And that’s for a sedentary individual. As your activity level increases so should your protein intake. The reason being that the more active you are the more muscles you breakdown and repairing it requires you to have more protein. It’s like building a house, if something happened to the house while your building it and some of the structure was damaged, you would need more material to fix the damage. Without the necessary building material, you wouldn’t be able to fix the house. The same principle applies to your body. This is especially the case if you’re doing activities that require more force and hence more muscle recruitment, like lifting weights, jumping and sprinting. More muscle you use the more protein you need to repair it. The exact amount will vary according to each individual and their activity levels, but below is a general rule of thumb for your protein consumption. In order to calculate the amount of protein, you need to consume, the first thing you must do is get your lean body mass. Your lean body mass is your body fat (weight) subtracted by your current bodyweight. And in order to get that, you need to calculate your body fat percentage. There are a number of ways to get your body fat percentage. The most accurate being the hydrostatic weighing, where you’re required to submerge your entire body underwater for a given amount of time, repeated 4 - 5 times. The obvious downside to this is that it’s not readily available for everyone. The next common method is the skin calipers. The downside to this method, is that the accuracy of the result is directly correlated to the person administering it. And again, not everyone has access to it. The next method has recently gained in popularity, simply because of the ease of use. It’s electrical impedance. This is a machine where you either hold on to it or stand on it with your bare feet and it sends an electrical pulse through your body to figure out how much body fat you have. The downside to it, is that the accuracy depends on the machine. Some machines are quite accurate, where as many of the portable units that are sold in stores have a much less accurate reading. The range of accuracy is too wide (at least for now) to make it a reliable source. Last, but not least is the military calculation method. This was developed by Hodgdon and Beckett in 1984 and later updated by Hodgdon and Friedl in 1999 at the Naval Research Center. The equation was developed using their large statistical data in order to help develop uniforms, weapons and other related equipment. The equation requires you to measure your height, waist and neck circumference for men and height, waist, hip and neck circumference for women. The equation is given below. It’s a complicated equation, but according to the study, the equation was chosen because the outcome closely represented that of the hydrostatic weighing. For those of you that can’t be bothered with the equation, you can check out the chart here where you can look up your body fat percentage according to your height and the calculated circumference value**. Note: The chart does not give fat percentages for men under 9% body fat and for women under 19% body fat. After you find out what your body fat percentage is calculate your body fat mass by multiplying your weight with the body fat percentage. Eg. body fat percentage is 19% and your current body weight is 140 lb. 140 x 0.19 = 26.6 lb of body fat. So let’s assume that your lean body mass is 113 lb. Here’s the break down of your recommended daily protein consumption according to activity levels. These are just ball park figures and each individual amount will change depending on their situation, but it’s definitely a good place to start. Since we’re talking about proteins, and why it’s so important to your body…let’s take a closer look. Protein is composed of a chain of amino acids. There are probably more than a hundred different amino acids that are available on this planet, but only 20 are necessary for our body. These amino acids are classified as essential and non-essential amino acids. There are 10 non-essential amino acids which are amino acids that your body can make on its own and there are 10 essential amino acids which are ones your body can’t make. The essential amino acids has to come from protein in your diet, and the best source is animal protein that come from foods such as red meat, poultry, fish, eggs and dairy. These foods provide “complete” proteins since all 10 essential amino acids are available. Plant proteins on the other hand do not provide all of the essential amino acids (with the exception of soy). These are also known as “incomplete” proteins and are found in foods such as vegetables, legumes, brown rice, nuts and seeds. Foods with “incomplete” proteins contain different combinations of essential amino acids and if you combine the right types of (plants) foods, you can get all of the necessary 10 essential amino acids. However, that being said, the bioavailability of these plant proteins are not nearly as good as animal protein and so unless you’re a vegetarian, it’s best to get your essential amino acids from foods that provide “complete” protein like red meat, poultry, fish, eggs and dairy. Consuming sufficient protein combined with ample healthy fats allows you to curb your (refined) carbohydrate intake as well. Consuming refined carbs is the biggest reason for gaining weight along with a slew of other health problems. I won’t get into the details in this article, but it basically boils down to insulin. The more refined carbs you eat, the more your insulin rises and the fatter you get…it’s as simple as that. You can cut out refined carbs and replace it with unrefined carbs like vegetables and fruits. These foods have much less impact on your insulin, so it won’t increase your fat accumulation. As mentioned earlier, your body technically does not (technically) need carbohydrates to survive. Remember, carbohydrate provides energy, but our body has an amazing ability to turn fat and even some protein into the same basic components, that carbs breakdown into, to provide energy. The process is called gluconeogenesis, and it converts other non-carbohydrate food sources into energy in the absence of sugar, and the best part about this process is that it forces your body to burn fat as the primarily energy source instead of sugar, so you can burn more calories from your stored fat. Now don’t get me wrong, I believe that unrefined carbohydrate is vital to a well balanced and healthy diet, but the benefits from the foods like fruits and vegetables don’t necessary come from their sugar content, but rather from other micronutrients, like vitamins, and anti-oxidative qualities that they provide instead. 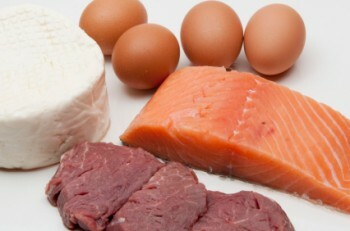 Are you consuming enough protein in your diet? Did you know that your body needs a certain amount of protein to sustain itself? Did you know that consuming protein can help you lose weight? About The AuthorShin Ohtake is a widely recognized strength coach and fitness & fat-loss expert. His unconventional, no-nonsense approach to getting fit has made him the go-to source for fitness enthusiasts and trainers alike. Shin is also the author of the world famous, MAX Workouts book, which has transformed and reshaped the bodies of thousands of people across the globe - without requiring hours in the gym. To learn more about how Shin Ohtake can help you achieve your fitness goals, visit MAX Workouts.